When you look at Bohyun Yoon‘s work, nothing is as it seems: a business suit is plastic, not pinstriped; fully-formed shadows are cast by fragments of figurines; male and female figures combine in a series of sketches. Even his CV reshapes things, making a mandatory stint in the South Korean military a performance piece entitled Two Year Soldier Project – Disguise Myself as a Solder for Two Years, which he completed with postcards advertising the event. “Bohyun Yoon: Embody,” a new solo exhibition opening this week at the Center for Emerging Visual Artists, will showcase a selection of the native Korean artist’s work from the last 10 years, some of which draws heavily on glass, which he studied at Tama Art University in Tokyo (BFA, 1999; MFA 2001) and RISD (MFA, 2004). Curator Amie Potsic immediately thought of Yoon for an exhibition as part of the Philadelphia International Festival of the Arts, which claims inspiration from the spirit and innovation of the Paris art scene in the early 1900s. “Using the idea of pushing boundaries and exploring new ways of presenting traditional media, that made me think of Bo and his work,” she told the GLASS Quarterly Hot Sheet. 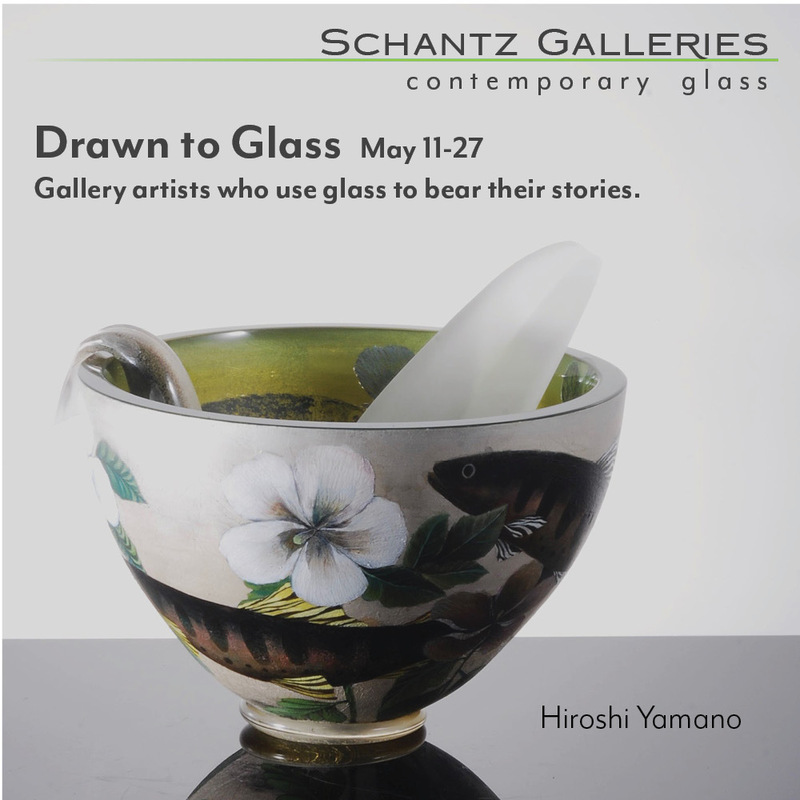 “He is so incredibly skilled with glass, with other forms of mold-making, sculpture, and installation. The way he pushes the boundaries of those media is so surprising and exciting.” Yoon is currently a fellow at CFEVA, where Potsic directs the program. “He comes to us at a critical point in his career, where he is making incredibly sophisticated and professional work. The important thing now is for people to see it,” Potsic said. 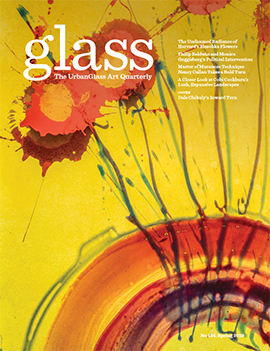 Glass is one of the many media through which Yoon explores two of his central themes: the mind-body connection and how we communicate with one another. He draws heavily on his time in the army, which he describes as an “environment of intense control” in which “my superiors tried to brainwash all the new soldiers.” In keeping with his interest in communication, he layers whimsy on top of more serious subject matter, making his art more approachable for the viewer. The mix of humor and serious subject matter, especially for the theme of communication, brings to mind visual artist Xu Bing and his own playful spin on language and semiotics. Yoon’s struggles with the language barrier when he first arrived to the United States from his native South Korea are presented as surmountable with the help of Mirror Mask. He created what are essentially headbands with mirrors attached to explore how we best communicate with one another. Yoon notes on his Website that “observing people’s faces and gestures helped my understanding, and I started to inquire and develop a project about non-verbal communication…This mirror shows more angles of the face so that it helps communicate and exaggerate our facial expressions to one another.” Visually mimicking ears, the mirrors put forth a possible tool for better understanding, while the unwieldiness of the piece calls to mind chindogu, the art of creating “unuseless inventions.” Yoon told the Hot Sheet he did not think about chindogu while making the piece, but added that “I like its absurd brilliant ideas.” In Mirror Costume, a piece not included in the exhibition, Yoon adds more mirrors to distort the human form. In Sound of Glass Instrument, a four-minute video piece available online here, glass is the very conduit through which two individuals interact with one another; the twist is that they wear glass vessel/helmets full of water to do it. The video depicts multiple performers dressed in black shirts and white swim caps under their vessel/helmets. Smiling and serious, coordinated and dancing, they wet their fingers to play the helmets as one would a wine glass, creating different sounds based on the amount of water in their helmets and the size of their hands. Like drinkers using the Spanish porrón, a traditional hand-blown vessel for sharing wine, the performers pour water into one another’s helmets without physically touching, connected instead by the stream of water. Also included in the exhibition are two works exploring the human form and collective versus individual identities. Structure of Shadow combines hanging rubber heads, limbs, and torsos with a light bulb to cast marching shadows on all four walls. Yoon describes it as “a simple light and shadow trick” that “becomes a metaphor for invisible power or tricks of politics in our society.” A motion sensor causes the body parts and shadows to dance as the viewer approaches. “It is energized by the participation of the viewer. His work is completed by this experience with the viewer,” said Potsic. Reforming, a nine-channel video piece, fragments the body in a different way by showing a mosaic of massage sessions complete with hands, legs, backs, and belly buttons. The piece can be viewed on Yoon’s website here.